Eisner nominated Steve Hamaker, colorist of the Scholastic editions of Bone, has a creator owned comic series called Fish 'N Chips. Steve and I being from the same home-town of Flint, MI, we struck up a friendship a few years ago at a con (though we never knew each other in our Flint-days). Steve is getting ready to release another Fish 'N Chips collection and asked me to contribute a pin-up. I was happy to. Here is the pencil sketch, inked, greyscaled and colored versions of the image. In return, Steve sent me a Mouse Guard pin-up I really love and can't wait until it can be published. I received the hardcover editions of Mouse Guard in German a few weeks ago. Cross Cult, my German publisher, asked to do a traditional release and a limited edition. The limited version has a leather-like cover with a black image of Lieam and a snake wreathed in maple leaves. It also contained a signed and numbered print of the 'harvest' (or 'ernte') image. Both are great editions of Mouse Guard and I'm proud to have the book in other countries in other languages. 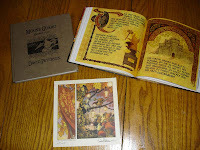 I have remodeled my parent site to reflect the design of mouseguard.net. The old place needed some dusting and sprucing. The work featured there is more current and features the same 'news' feed as mouseguard.net (which makes it much easier to update!) Keep a lookout for more new pieces being featured on the site as I continue to do some freelance covers, comic shorts, and a children's book with Harper Collins. While at Gencon, I picked up an awesome page (pictured) from Mark Smylie from his book Artesia. Mark mentioned getting a piece of my artwork and I told him that I owed him a page for the awesome pin-up he contributed in issue #4 of Fall 1152. He opted, instead, for a Artesia pin-up from me. I am really looking forward to doing an Artesia piece. I'll share my work on it when I get to the work. This painted set of Guard-mousey-goodness was sent to me by Adam Dodge. Adam said he painted these over the summer and I certainly thank him for doing so and for sharing them with me. How can we get our hands on that MG German hardcover!? I saw a couple of the German hardcovers on eBay a couple of weeks back when looking for Mouse Guard items. There might be your best bet.